King Leontes seems to have it all - his beautiful wife Hermione who is expecting their baby, a son and heir to the throne, and even a best friend in King Polixenes, who rules an adjoining kingdom. But his jealousy ruins everything for him. When Hermione manages to convince Polixenes to extend his visit when Leontes could not, he suspects that they are having an affair. Polixenes hears of his suspicion and flees, but Hermione stands trial for her supposed crime. Soon after the trial, she dies and Leontes orders that their infant be left in the wilderness to die. Sixteen years later, the consequences of Leonte's decisions will come back to haunt him. 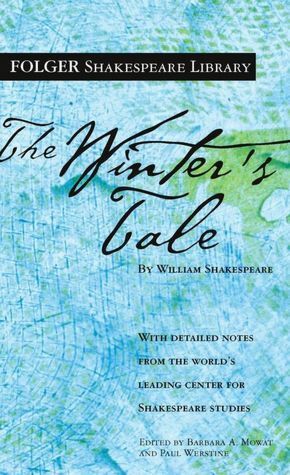 The Winter's Tale is somewhat of an anomaly among Shakespeare's plays. While most of them are classified as a tragedy or a comedy, this play is both. The first act is very much a tragedy, akin to Othello. Leontes is consumed by his jealousy and he makes big sweeping decisions without thought for the consequences. The play marks a change in tone with the best and most wonderful of Shakespeare's stage directions. "He exits, pursued by a bear." Yes, we have officially crossed over into comedy territory. It's time for young lovers whose parents don't approve of their match, crafty but delightful crooks, and some bumbling shepherds. The characters in The Winter's Tale are an interesting bunch. While we get some very specific types (Leontes as the jealous husband, the young lovers, Autolycus as the clown), Shakespeare introduces us to one of his truly unique characters in Paulina. She is an attendant to Hermione and she is the one who gets to call Leontes out on all of his ridiculousness. It's nice to see a woman who gets to break out of the role of lover. Paulina is married already, so romance is not on her mind. However, justice for the woman she serves and loves is a prime concern of hers. While several characters make jokes at her expense because she does not bend to the authority of the king or her husband, she is well respected in the kingdom as she speaks truth in every situation, regardless of the personal repercussions. The Winter's Tale is not Shakespeare's most popular play because it does not fit neatly into a category and it lacks the instantly memorable lines of other plays like Hamlet. However, this story is imbued with a unique sense of magic and possibility. The reader gets to encounter unforgettable characters like the courageous Paulina and the clever clown Autolycus. And hey, this is Shakespeare. The play is, and always will be, the thing. This sounds great! I knew of it, but never heard much of depth about it. I like that this doesn't fit neatly into one category. I actually saw a play called Melissa Arctic a few years ago that was based on this one. I've wanted to read the source material ever since! I was just talking about The Winter's Tale at lunch yesterday! What a funny coincidence. I was saying that I really need to re-read it (it's been ages! ), and your review confirms that. I was a theatre/English major in college, so I've read most of Shakespeare's plays. I wanted to finish the list though, so I added the rest of them to my Classics Club list. Do you have any thoughts on which one you would like to start with? I knew nothing about this play until I went to a production at the Sydney Opera House earlier this year. I was a little under prepared for the tragedy/comedy angle - a strange mix of King Lear and Twelfth Night. I admire you for reading the play, I struggle to see the action in a reading. That sounds fun! I will always agree that seeing a play is better than reading it. But I think that you can read still appreciate the language and the story through reading.